Initial Phase: The Weather is clear in Zones D and E, Sea is calm in Atlantic and Mediterranean. All units are in supply. Spain generates 3 GSPs in Madrid and 3 in Sevilla. 3 German Infantry RPs are used to replace the 98th Mountain regiment (3 remain). This unit appears in Tarragona. 2 German Me110Cs from Zaragoza and Barcelona fly CAP over 33:3633. Movement Phase: The 15th Mountain Corps takes advantage of the lack of ZOCs to move around behind the Spanish that are blocking the way to Valencia. It moves to 33:3634, surrounding the defenders. The 98th Mountain regiment that has reappeared in Tarragona moves up to the mountains in 3533. Additional follow-up forces arrive in the form of the 62nd Corps, which enters 3532, absorbing 2 artillery regiments stationed there. Further rail regauging takes place. The 4th RR Engineers regauge 3623 and 3624, while the 1st RR Engineers convert 23A:1902 and 1903. The 63rd Corps moves over land from 3229 to 2832, securing ownership of the final hex of the transportation line from Lerida to Zaragoza. This allows the 66th Corps to administratively move towards Madrid, ending up in 23A:2704. The 674th Combat Engineer regiment uses administrative movement to get from 3128 to the rail break at 2702. Preparations are made for a forward airbase by the 512th Combat Engineer regiment, which administratively moves from 33:3523 to 3532. Meanwhile, the 108th Construction regiment in 3626 hops on a train as far as Zaragoza. With 2 MPs, it repairs the hit on the airbase there, before advancing one further hex to 2734 on the banks of the Ebro river. A traffic jam is now becoming evident on the coast road leading to Valencia. This forces the 65th Corps to head into the canal system at 3631 from 3530. Its siege artillery at least will now be able to reach Valencia next turn. In France, the 16th Construction regiment abandons its temporary airfield in 2029. It uses rail movement through France and into Spain, to reach the rail break in 3521. Also in France, 9 Resource Points are railed to San Sebastian, for use in increasing the capacity of the Spanish rail net. In the Madrid area, the 64th Corps advances very close to the city, as far as 2707. It is followed by the 34th (Armoured) Corps which advances to the outskirts of Madrid at 2609. Also advancing to high ground overlooking the city is the 53rd Corps, which moves over the mountains and stops in 2610. Further north, the 71st and 7th Construction regiment combine to build a temporary airfield in 23A:2006, next to Burgos. The 7th then moves to take over maintenance of the adjacent airfield in 2107. 3 Ju87B rebase to the new airfield from Santander. The final step is that the 604th Engineer is now free to move to 2207 and construct a 3rd temporary airfield in the area. This airbase sees the arrival of a Me109e and Me109F from Bilbao. All the German short range aircraft are now in range of Madrid. The SS TK Motorised division heads west from Valladolid to Salamanca, where it overruns the 7th Engineer regiment at 12:1. It then continues west to complete movement in 2217. Its former partner, the 7th Panzer division, heads south to occupy Avila in 2312.\, where it is joined by the 22nd Air Landing division. Valladolid is garrisoned by the 151st Motorised Heavy AA regiment. In Gijon, the 11th Infantry division breaks down into supported regiments. A 2-6 unit stays in the city as a garrison, while the other units move through Leon to 1410. The 263rd Infantry division moves from 2304 down the road with admin movement to 2706. Axis air units decide to show the citizens of Madrid the price of resistance to the German war machine. 4 He111H4s and 2 Ju88A4s take off from Barcelona and Bilbao. The units in Barcelona stage via Bilbao and San Sebastian in order to reach the target. The mission is escorted in by 2 Me109Fs and a Me109E from 2107. Faced with the possibility of facing even more enemy fighters next turn, the Spanish air force decides to intercept the mission. Two CR32bis fighters take on the escorts while the Spanish Me109s try to bypass the screen. The bypassing unit is fired at by German Me109Fs, 8 coming up for a miss. The Cr32s and Me109Es fight out a bloody stalemate, with 1 unit from each side aborted. Meanwhile the Spanish Me109s that penetrate through to the mission force abort a He111H4 at no loss to themselves. 5 bombers still remain however, and the 5 points of AA in the city open up, returning a Ju88 and a He111. The 3 remaining bombers release their bomb loads indiscriminately, achieving widespread destruction – 2 hits and 4 VPs for the Axis. 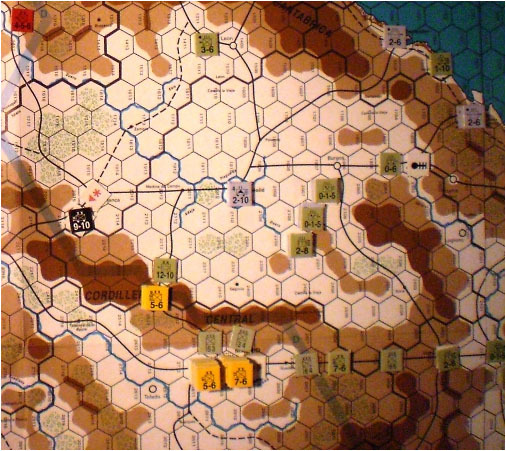 Combat Phase: Hex 33:3633 is surrounded on 3 sides by the German 15th and 25th Corps, plus the 98th Mountain regiment. The defenders count a total of 8, while the Germans have 45, with a net +1 modifier for half AECA in rough terrain. A 3 is rolled modified to a 4 for a DH, but the surviving units are destroyed by ZOCs. The 25th Corps advances into the hex. Exploitation Phase: The 25th Corps advances to the outskirts of Valencia in 23A:3703, but it detaches the 4th Panzer division to 3503 in order to threaten the Spanish units in the mountains at 3403. The SS TK Motorised division moves west to Caceres, overruns the 11GC security regiment, and then heads back east to 2115, right at the edge of the German supply envelope.